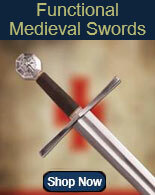 Legacy Arms Swords has created battle ready, medieval swords for sale that offer both function and beauty. This collection of medieval swords presents blades made of 5160 tempered, high-carbon steel with a tough apple-seed edge and full tang construction. 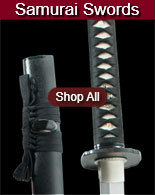 Incorporating historically accurate designs, many of these items are modeled after real swords used throughout the ages. 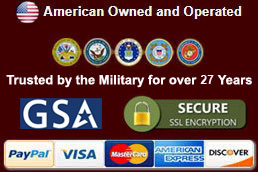 Buy swords in a variety of styles from Legacy Arms and Generation 2. Legacy Arms Halfling Swords for sale are 22 inches in all and weigh 2 pounds. 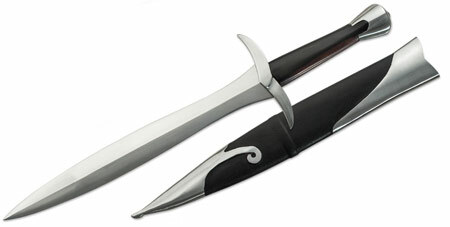 These popular Halfling Swords are a functional full tang short sword that features hand polished high carbon steel. The sharpened 15 inch 5160 high carbon steel blade is hand forged. All of the metal on the Halfling Sword is hand polished to a shiny finish including the metal parts of the scabbard. 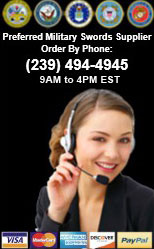 They have a 6 inch Macassar Ebony handle and a point of balance at ½ inch. The hardwood scabbards are covered in black leather with glossy steel accents. They feature a design similar to popular movie swords. They are handmade in The Philippines. 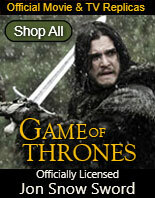 Buy the Legacy Arms Halfling Swords for $209.99.